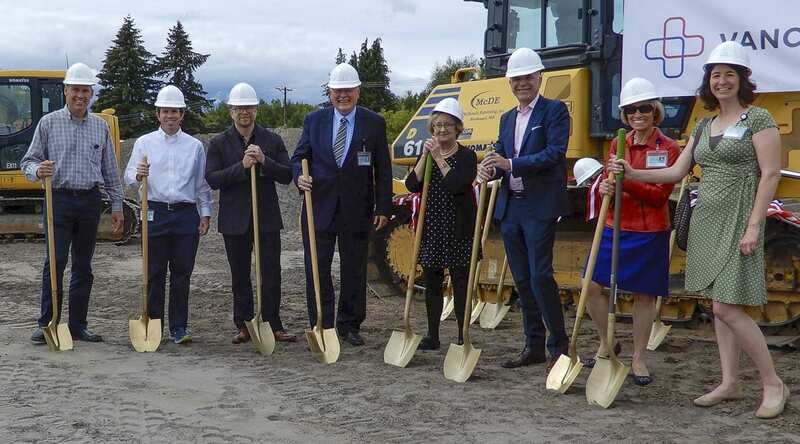 RIDGEFIELD — Vancouver Clinic joined together with local officials and honored guests this week to officially break ground on the newest Vancouver Clinic location in Ridgefield. The 15,400-square-foot clinic will offer primary and urgent care services. Nearby Vancouver Clinic locations in Salmon Creek and Battle Ground will continue to meet specialty care needs of residents in North Clark County. Opening summer 2019, it’s expected the Ridgefield location will have up to 10 clinicians and 20 support staff. Vancouver Clinic selected Ridgefield for expansion since in recent years it has been one of the fastest growing cities in Washington State. The Vancouver Clinic looks forward to growing with Ridgefield and serving the medical needs of the community. Vancouver Clinic selected Andersen Construction as the general contractor. Day CPM is managing the project. ZGF is the architectural firm with MacKay-Sposito providing engineering services. Vancouver Clinic has served the community of Southwest Washington since 1936, and is the largest private, multispecialty clinic in Clark County. Vancouver Clinic offers five locations across Vancouver, Battle Ground and Washougal, and provides 40-plus medical specialties. For more information, visit www.tvc.org.